Think about that feeling you get when you check in to a glamorous overseas hotel. the sea air, the awe-inspiring luxurious appointments, and the anticipation of being spoiled. it’s like crossing a threshold into a complete escape from the outside world. Now, imagine that feeling every day. 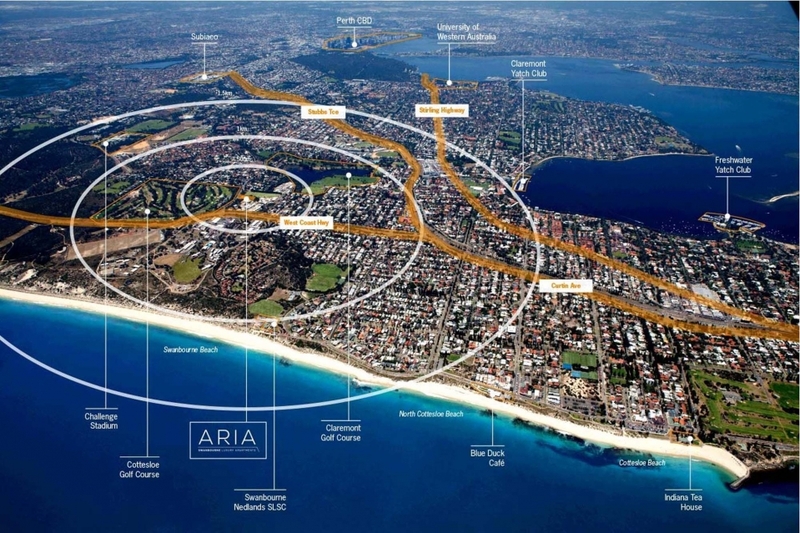 Nestled alongside the prestigious cottesloe Golf course and the green playing fields ofswanbourne school, aria sits in the centre of perth’s aspirational western suburbs. 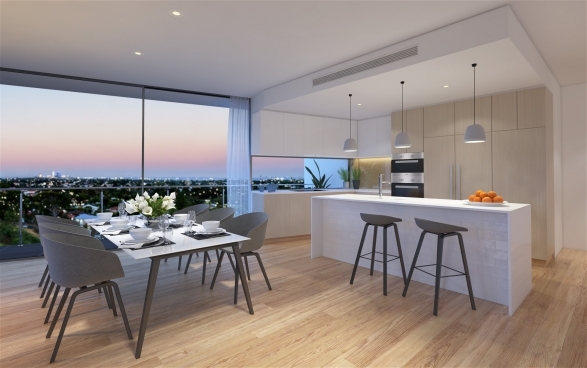 the spacious balconies open on to views of the perth cbd on the eastern side and the sounds of the indian ocean westward. 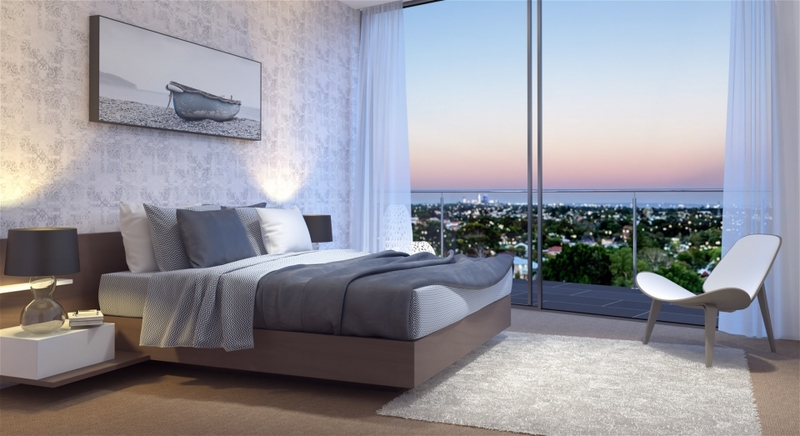 Aria Luxury Apartments offers a luxurious sanctuary in one of Perth's most exclusive beachside precincts. Designed for the discerning owner-occupier or investor, no detail has been overlooked to create the ultimate urban lifestyle. With breathtaking architecture, a stunning lobby and an expansive resort-style pool, Aria brings the vibe of a five star resort to your very own private residence. With its remarkable relaxation oasis, superb yoga and massage centre, plus dining and entertainment facilities, Aria promises an exciting and richly fulfilling living experience. Come home to a luxury holiday retreat, every day of the year. 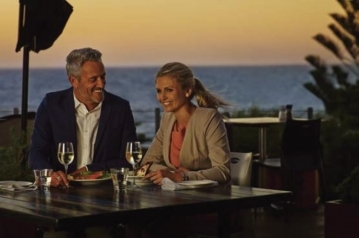 Imagine starting your weekend with a dip in the sparkling Indian Ocean, then strolling across the pristine sands of Swanbourne Beach to the sundeck of the beachside café for your morning coffee and gourmet breakfast. 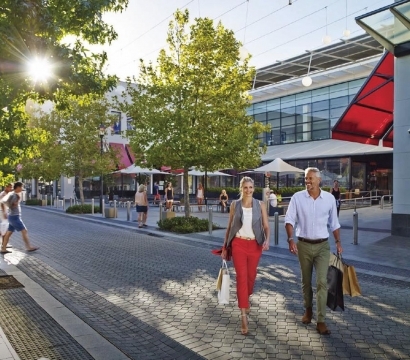 Minutes down the road is the vibrant shopping hub of Bay View Terrace and Claremont Quarter. Fresh produce and gourmet groceries sit right alongside designer labels and luxury outfiters in this spectacular centre. 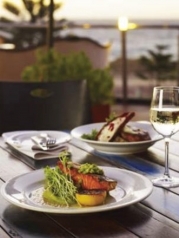 Claremont also boasts an array of bars, nightlife and some of Perth’s best restaurants. 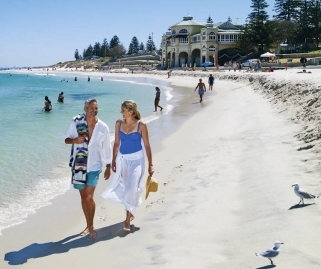 You’re also a short drive from Cottesloe’s eclectic Marine Parade with its cute seaside cafes plus the iconic Indiana Tearooms, Ocean Beach Hotel and the recently revamped Cottesloe Hotel. Claremont Showground, nearby, is a mecca for festivals and large events. and you’re also minutes away from the recreation precinct of Challenge Stadium, State Swim, Perry Lakes, Bold Park, WA Athletics Stadium and the State Basketball Centre. Perth’s prestigious private schools, Scotch College, Perth Ladies College, Christchurch, Methodist Ladies College and St Hildas are all close by, as well as Swanbourne and Mount Claremont Primary Schools. 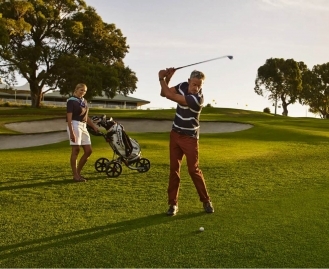 Cottesloe Golf Course is directly opposite Aria Luxury Apartments but, if you prefer a nice walk not to be spoiled by trying to hit a white ball, a stroll past the Swanbourne Primary School playing fields leads you to a walktrail around the picturesque Lake Claremount reserve. With Aria at the centre of everything you love, this must surely be the western suburbs’ best address. From the astonishingly chic timber-panelled ground floor lobby to the breathtakingly hip rooftop skygardens, Aria makes an elegantly contemporary architectural statement on every level of this fie storey wonderland. As you arrive, a linear stone path draws your eye into the lobby and through to the pavilions beyond. The lobby’s bold features are softened with some warm residential touches to feel homely and inviting. A plush rug set into the polished stone flooringentices you to dwell a while and be seduced into the comfortable leather and woven fabric seating under the warm pendant lighting. As you enter Aria, you enter a world of excess. it’s a vibrant, indulgent haven brimming with places to hang out, relax, eat, drink and play. The sparkling pool is set in an expanse of deck area with exquisite tropical landscaping, day beds and cabana area. 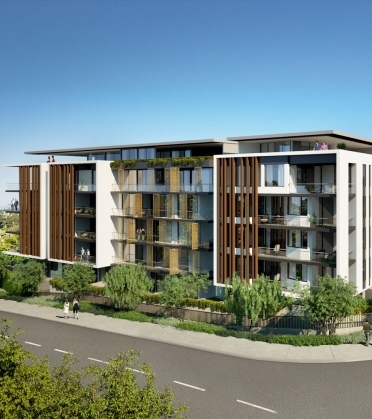 the elevation commands majestic views over the leafy suburbs all the way to the CBD and beyond. There’s a state-of-the-art gym, a beautifully serene yoga studio, and a very stylish sauna and steamroom. book yourself in for a massage, or enjoy the relaxing spa. Aria also has a private dining room that can be reserved, complete with a dedicated wine cellar. it makes a night in more like a night out. and sliding walls to bring the outside in. without needing to leave home. Each luxurious apartment features generous proportions for comfortable open plan living. It’s all about space, light and style. With contemporary fixtues and finishes, the eeling is a chic yet relaxed lifestyle. Quality appliances have been chosen throughout and the bathrooms feature designer luxury fixtues. 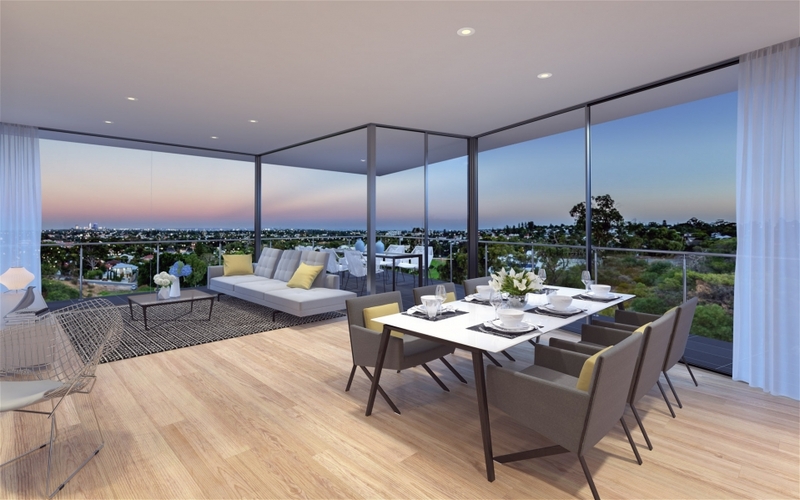 Views offer panoramas of the Perth skyline, lush green parks, leafy streetscapes and, for some, outlooks over the gold course. For those seeking the ultimate in apartment living, the Penthouse is the height of luxury. A dramatic double-height void gives a sense of arrival upon entry. Your attention is immediately drawn to the spectacular vista as the full length windows frame breathtaking views of both the golf course and the city. A contemporary open flame fireplace makes an architectural statement with the monumental double-storey cabinetry, and a floating staircase sweeps alongside like an exquisite piece of sculpture. The finishes and detailing in each room are meticulous, but the overall feeling is one of abundant space and relaxed charm. YOU'LL LOVE COMING HOME TO THIS. 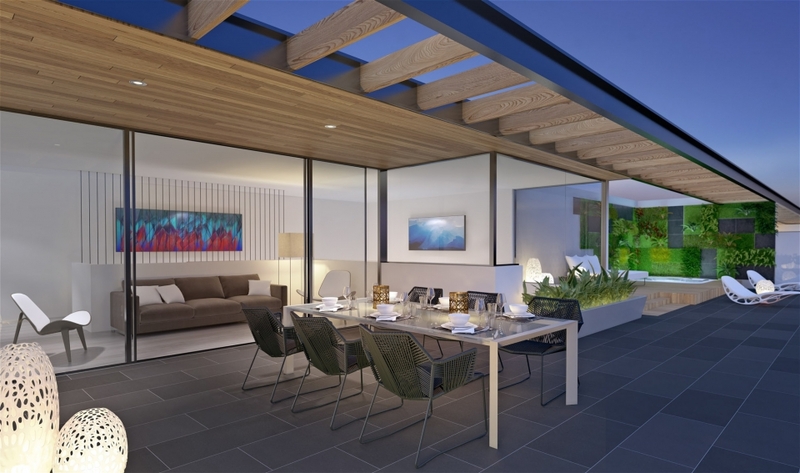 This is your opportunity to live a carefree resort lifestyle in one of Perth’s most sought-after beachside neighbourhood. Aria Swanbourne Luxury Apartments leaves no detail unconsidered. High quality appliances, designer fittings andsuperb craftsmanship will ensure that your home not only looks beautiful, it will perform flwlessly as well. You can also add your own chic finishing ouches with a range of custom designed upgrades to make your home truly your home. If this is the lifestyle you’ve always promised yourself, now is the time to seize it. Act now to secure your piece of Aria.